Goodreads says, "A modern retelling of the German fairytale "Tristan and Isolde", Tris and Izzie is about a young witch named Izzie who is dating Mark King, the captain of the basketball team and thinks her life is going swimmingly well. Until -- she makes a love potion for her best friend Brangane and then ends up taking it herself accidentally, and falling in love with Tristan, the new guy at school." At first glance, Izzie has it all. A mom who loves her, a devoted boyfriend who is captain of the basketball team, and a loyal best friend, Branna. Her world turns upside down when she makes a love potion for her best friend, Branna, with the hopes that she will fall in love with the new guy, Tristan. Tristan has been catching Izzie's eye a lot lately despite her best efforts to not look his way. She ends up drinking the love potion and falls in with love Tristan which, consequently, changes everything and sets off a series of events that will impact Izzie's world. Harrison's Tris and Izzie, based on the classic fairy tale of Tristan and Isolde, has a lot of potential, but fell completely flat for me. 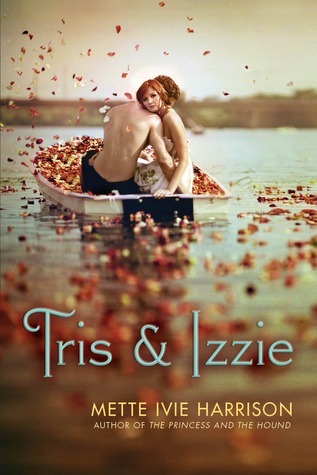 Tris and Izzie, unfortunately, is a reminder to never judge a book by its cover. The cover for this book is simply stunning; I love it! But that's all I love when it comes to Tris and Izzie. Izzie was such a flat character. I wanted to get to know her more, but I could only brush the surface. I never truly understood her emotions, her actions, and in turn, I felt indifferent. Nothing was believable. Also, Tristan, one of my favorite literary heroes in the original tale, also fell flat in Tris and Izzie. He is but a shell of his original character and was completely one dimensional. There are scenes that *should* be very dramatic and suspenseful, but because I didn't believe the characters, I found the events to be humorous as relationship statuses change quickly (and not because of a love potion!) without so much as an afterthought and we know in high school, that would never happen. Fans of the paranormal may enjoy the various creatures in Tris and Izzie as well as Izzie's dealings with magic. I wasn't expecting witches, sorcerers, a magical world, or supernatural creatures, so I was surprised by this. I found these parts of the story to be the most enjoyable, but not necessarily believable. I've haven't read Harrison's other novels, but her writing style did not work for me. at. all. I actually feel bad since I am being so negative, but I must be honest. Simply put, I don't get Tris and Izzie at all and I couldn't be more disappointed. Like I said before, the story has a lot of potential, but for me, that potential is never fully realized. On a bright note, thanks to The Book Butterfly's generosity, I will be bringing this ARC to my classroom, because perhaps I am just too darn old for Tris and Izzie and a younger reader may enjoy this contemporary retelling. I haven't read this yet but I am not planning to now. I read other negative reviews by Amazon Vine reviewers too. I have read some of Mette Ivie Harrison's other books (The Princess and the Hound, The Princess and the Bear) and I liked the first one though it was a little odd. Magic and fairytale kind of stories seem to be her strength. This may have been stretching it. Thank you for sharing an honest review. You aren't book/author bashing but instead offered a truthful opinion and that is what matters to readers. I was so excited for this one (because of the cover! )but even though I got it from Netgalley I haven't read it and I don't plan to because I've read nothing but bad things about this one. I'm sorry you didn't enjoy this one. I just recently finished a book I wanted to like, but couldn't. I always feel bad for not liking a book, but it happens. It seems like hardly anyone has anything positive to say about this one other than it has a gorgeous cover. I've read 'The Princess and the Hound' and have 'Princess and the Bear' in my To Read stack...'Hound' was written very well, but it's set in a past, fantasy world...Maybe that's the difference here, and Harrison should've set Tris & Izzie somewhere NOT contemporary "reality"...Still want to read it, but definitely going to wait for the Library to get it! Bummer. That's what I've been hearing about this one. Too bad. It sounded interesting. Thank you for your honest review. I'll skip this one. Waah :( I'm sorry you didn't like it! i've seen many other similar reviews of this one though, so don't feel bad. I have yet to read a good review of this book. Glad to see my instinct to take it off my TBR pile was correct! Eek! Sorry to hear this one is a bummer -- I've had my eye on this one since first glimpsing that gorgeous cover. But sounds like I need to stay far away!